hen you choose Treecologic, you’ll be trusting your home and property to the care of professionals. 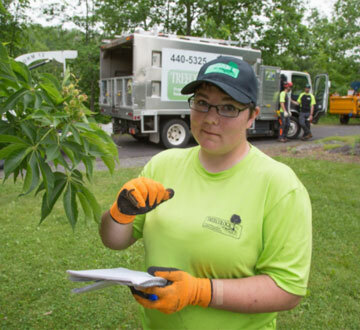 Our quality approach to tree and shrub care is backed with a strong education and adamant desire to gain more knowledge about the technology and science of urban forests. We use environmentally friendly methods and work with a positive, proactive attitude to ensure your satisfaction. Most importantly, we’ll communicate with you every step of the way—before, during and after the sale. We’re fully committed to doing what it takes to make you happy. If for any reason you’re not satisfied with our work, we’ll return to re-diagnose and repair, if necessary, at no additional cost. Trees have been my passion for as long as I can remember and I have spent the last ten years developing that passion into a career. 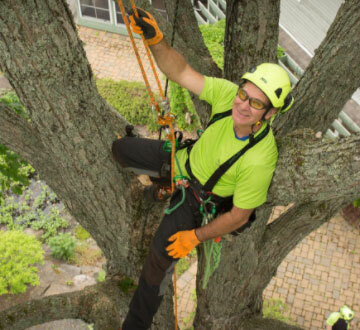 During my time in the tree care industry I’ve gained valuable experience working with talented arborist in the East and West Coasts of Canada, Massachusetts and Bavaria, Germany. Along with my working experiences I’ve acquired a solid background in Arboriculture through my studies at the Nova Scotia Agricultural College where I completed a Bachelor of Technology in Environmental Horticulture. 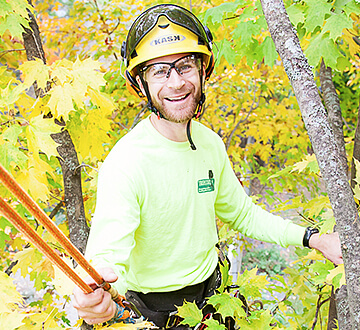 Since then I have become a Certified Arborist and a Certified Treeworker – Climber Specialist. I started Treecologic in 2009 because of a need and desire to preserve trees in the greater Fredericton area. I am proud of the talent within our current team and the service we provide. I have been working in the field of arboriculture for the past three years and have grown to love all it has to offer. I began in Moncton and had the opportunity to learn some of the many necessary skills from great co-workers. Since climbing is a large portion of our work, I have been trained in Emergency Readiness & High Angle Rescue, Arboricultural Electrical Safety, and Aerial Lift Evacuation & Extrication. 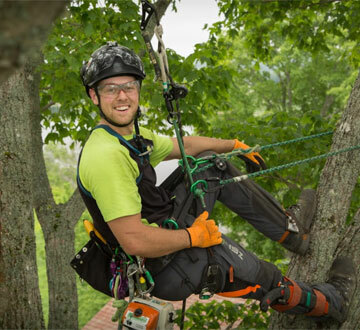 Most recently, I have taken a 3 day course in Arborist Technical Rigging I love being involved in the competitive aspect of tree climbing, and enjoy splicing and creating new gear. Joining the Treecologic crew has broadened my skillset, and with the wealth of knowledge our crew possesses, I’m sure it will continue to grow! I am the Administrative Assistant/Office Manager for Treecologic and have been with the company for 3 years. While sometimes you can find me in the office, I frequently work from home while hanging out with my two kiddos, Jonah and Kier. I have a degree in Business Administration from UNBSJ and enjoy working for a growing company that adds so much to Fredericton. I have always had a passion for the outdoors and environment, and bring an eye for detail to every job. My area of expertise is plant health and how it is affected by insects and diseases. While my interests are mainly academic, I don’t shy away from getting my hands dirty. I have five years of experience as an urban forester, and have worked with educational institutions, tree nurseries, municipalities, utilities, and private contractors. I have diplomas from Sir Sandford Fleming College in Forestry and Urban Forestry, and am an Undergraduate of Forestry at UNB. I have developed a broad range of skills working at Treecologic, and enjoy sharing my knowledge and experience. I have now been working with Treecologic for 10 months. My role on the crew is to do ground work and preventative maintenance and repairs on our equipment. Working for Treecologic has definitely been a huge learning experience. I really enjoy how everyday is something different and a new challenge. A carpentry trade brought me to the Maritimes where I studied for two years at Holland College in Prince Edward Island. In my travels I have found a new passion with Treecologic’s amazing team. I look forward to learning new techniques in the field and shop. I am a born and raised Cape Bretoner. After moving to Fredericton in 2009 for university, I then worked for a while after school before changing my focus and getting into tree work. I graduated with Honours from the Forest Technology program at Maritime College of Forest Technology in 2017. For my work placement at school, I was hired on by Treecologic for the summer of 2016 and was hired back after graduation where I currently hold the position of Arborist Apprentice. What makes working for Treecologic great is that every job is different, presenting a new puzzle to solve. I enjoy all aspects of tree work; whether it is up in a tree pruning out dead wood or on the ground running rigging ropes and chipping brush. In the end, I get to work outside alongside some great coworkers, which is why I love my job. I have been working in the arboriculture industry for over 30 years now. Within that period I have worked or trained in every province and territory except Nunavut. 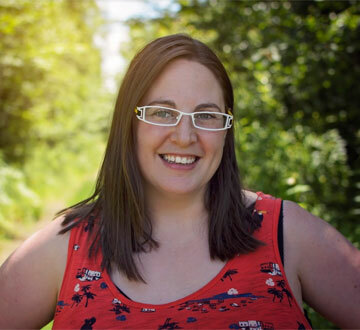 After graduating from the Nova Scotia Agricultural College with Diplomas in Landscape Horticulture and Plant Science, I began working as a utility and commercial arborist in Nova Scotia and have municipal arboriculture experience with the cities of Fredericton and Moncton. My current position with Treecologic is managing our utility contracts with NB Power and working and training our field staff. 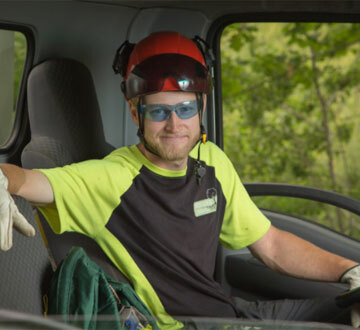 I am very passionate about my work which is why I have been a contract trainer for Arboriculture Canada Training and Education Ltd. since 2009 and have competed in regional and international tree climbing competitions for over twenty five years. Working safely and effectively is my priority. It was a natural choice for us to call Treecologic. Andrew’s extensive knowledge and skill really helped us address the uncontrolled and unplanned tree and shrub growth in our backyard. We see Treecologic as a long term partner in making our backyard beautiful and more sustainable. Andrew’s experience with trees is extensive. He ensures the safe, orderly and efficient trimming and removal of troublesome foliage. He also cleans up thoroughly, so you can continue to enjoy your outdoor space right away. I can only attest to the total professionalism and skill of Treecologic following their removal of an extremely large oak tree that towered over my pool, garage and backyard. The tree and root system was simply too large and too close to my property so I made the difficult decision to have it removed. Over the course of a day, I watched in fascination and with total confidence in the ability of the workers of Tree logic to take down the tree. They removed it limb by limb in a spectacularly controlled way without ever once putting person or property in danger. I can say I would not turn to any other company for tree removal having now seen the work and having experienced their business professionalism. I have used the competition in the past but will not again trade the comfort and confidence I experienced with Treecologic. Treecologic has been managing our ‘forest in the city’ since 2009. We first hired Andrew and his crew to remove an old tree in the front yard of our house. Very pleased with the results, tree gone, stump removed, no mess left behind. We asked Andrew for a consultation on how to manage the trees on our property. We were provided with a detailed action plan and estimate, and work started the following spring. We love our property to stay green, healthy and aesthetically pleasing. Treecologic has not let us down. In fact, the company has saved us money thanks to their expert advice. Trees we thought needed to be cut are now professionally pruned, some eyesore trunks now receive proper light that spurs new growth; others provide nesting or feeding grounds for the birds we love. The back yard looks luscious and beautiful. We were especially pleased with Treecologic’s overall professional service. The crew showed up on the days specified; proper safety measures were taken; our flowerbeds were left undisturbed; no mess was left behind; the work matched the plan; the bill matched the estimate. It’s nice to find a company that delivers. We can recommend this company. Sally and I were impressed with Andrew and his crew. They understand trees and urban forestry. They were polite, on time, safety-conscious and cost-effective. The work that Andrew and his crew did on my yard this summer was spectacular. I’ve been working really hard for the past five years to create an urban garden. Removing trees and grinding out old stumps has allowed me to double the size of my veggie garden. Their pruning recommendations have doubled the amount of sunlight that reaches the plants, and the trees look so much healthier with good air-flow between them. I really appreciated how Andrew cared for my garden, including knowing when to cut. He’ll be back in October or November to prune the fruit trees when they are dormant, and he’ll wait until my perennial bed has been safely mulched over to shape an overhanging stand of white pines. Given the money and time I invest in my garden, it makes good sense to have the crew from Treecologic come back at least once a year to keep the trees in great shape for the future. Thanks Andrew and company for a job well done! I had the good fortune to learn about Treecologic and Andrew Hayes a couple of years ago. This is the second season he has trimmed my trees and shrubs and they have never looked or grown better. In the past, I have used several tree trimming services and they all focused on the exterior shape of my shrubs trimming only on the outside to give the desired look. This was resulting in many of my shrubs dying off on the inside. Andrew focuses on the entire shrub and trims from the inside out. Not only do they look better but they are now healthier both inside and out. Andrew Hayes is a true professional in every sense of the word and has a wealth of knowledge. He shows up on time, knows what he is doing, his work is neat and tidy, and he completely cleans up when he is finished. As a result of his work I have received many compliments on my trees and shrubs. Thank you Andrew, you’re the best! I asked for a consultation and received an education in tree science. It’s obvious they are not only passionate about their work, but have a great depth of knowledge and really care about trees and their customers as well. Thanks to honest and practical recommendations, I now have a better understanding of every tree on my property, what each needs and when, and what is highest priority. The first piece of work was done exceptionally. I will hire Treecologic again. I have used the services of Treecologic twice. 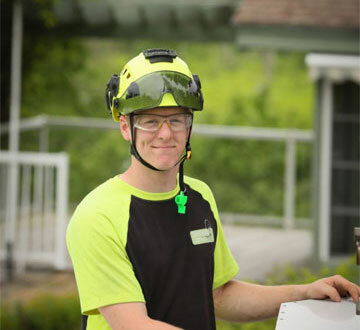 Andrew and his team have tackled several large and small projects that needed attention, including the removal of part of a large maple tree that fell in a wind storm, revitalizing overgrown lilac bushes and the pruning and shaping of trees to allow more sunlight into the garden. Andrew provided me with a quote and a clear description of the work to be done and on all counts I was impressed, from the preliminary visit to the final cleanup. I received expert and courteous service from Treecologic and I will continue to call on them for all my tree care needs. I highly recommend this young and motivated company.